As we know Facebook has now become the most popular Social Networking website of all time and Facebook have already beaten and killed many other chatting experiences of people includes Windows Live Messenger, Yahoo Messenger, Gtalk and somehow Skype also. People is now doing every single things over Facebook like sharing, connecting and even chatting with their friends and family members. 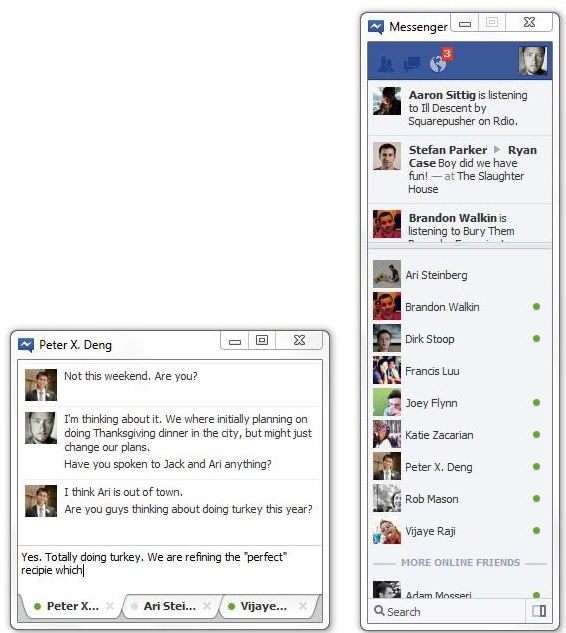 Facebook has begun testing its first Facebook Messenger for Desktop for its users. Soon Facebook users will be able to chat with their friends and family from their desktop software of Facebook, users will not have to use website to login for chatting they will be able to chat without being logged into the social network. Facebook Messenger is now official but yet it’s not available for downloading by the general public. We’re testing out a first version of the app with a small group of people. During this trial period, we plan on rolling out changes to the app and expect outages and periods of instability as we make improvements. Facebook Messenger for Windows will automatically install updates and the Facebook app will require Windows 7 to run on desktop pc. The app automatically syncs with Facebook, and it allows users to chat and message with their Facebook friends, and see ticker updates and notifications. Facebook said the app currently supports chatting and messaging only with individual friends, and not group chat or video calling.